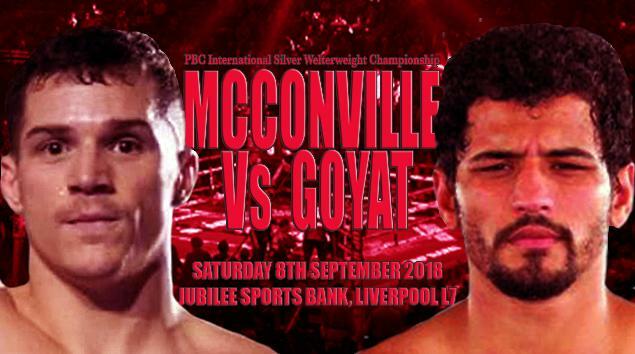 Promoter Kyle Gallagher announced earlier today that unbeaten Welterweight prospect Jonny McConville, is set to challenge Chandigarh India's Neeraj Goyat for the Professional Boxing Council (PBC) International Silver Welterweight Championship, at the Jubilee Sports Bank in Liverpool on Saturday 8th September 2018. McConville is in fine form and comes into this Championship contest off a first round stoppage win over Belfast's Michael Kelly back in March this year, his third stoppage win in as many contests, the other stoppage victories being over Marty Kayes in December 2017 and Will Cairns in September 2017. His esteemed opponent's Championship successes do not seem to have fazed McConville one iota, as he made clear when he spoke earlier. "I'm very grateful for this opportunity it’s something we have been working and training very hard towards. "I am very excited to fight for my first title and to put on a show against such a decorated and experienced opponent as Goyat. I want this so bad, I am definitely ready for this." Tickets for the event are available from any of the boxers competing or direct from the VFC Ticket Line on 07711 098025.